and other modems released between 2015-16. In order to get unlock code and to unlock these Huawei modems & Routers, we will need to read some data from the device i.e. IMEI, Hash 1 & Hash 2 and Encrypted Block. For getting the required said data from device, you have to perform a few simple steps. Download the required Software Tools and put in a single folder, like FcSerialDrv.zip, Latest Huawei Drivers/ Mobile Partner, DC-Unlocker, Downgrade Firmware, Upgrade Firmware for your device model, etc. Now you have option to choose one of the following two alternate methods that are explained with complete instructions and step-by-step guides. 1. In the first step get the Firmware Flash Code by just entering IMEI of your device, it will be used as password while changing the firmware in step #3. 2. 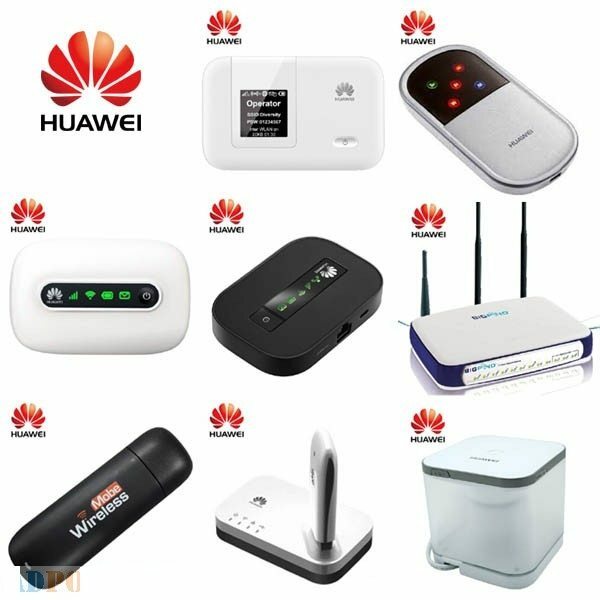 Install Huawei serial COM ports drivers or install Huawei Mobile Partner. Right Click on My Computer Icon => Manage => Device Manager, in Ports (COM & LPT) Section you must see COM Ports, such as FC – Application Interface (COM25) and FC – PC UI Interface (COM26). If you don’t see, then install the drivers from the step 2 and restart your computer. Green Circle 2 – Press “Read Data” button. Green Circle 3 – If all appears correct, you will receive values in Hash 1 & Hash 2 fields and detail of your device in log window. All other things explained in figure are for information only, don’t be confused. Note: This is very important, double click in Hash 1 & Hash 2 fields separately, values will be selected and then copy them by right click of mouse or Ctrl+C from keyboard and other detail of your device from log window in a notepad file and remember to save it. 6. After this, now you need to fill Data Submission Form as shown below. After you fill all fields, press “Submit” button, after it, you will receive a confirmation email. 7. & 8. steps to complete unlocking process are given below. * Make sure you have Power Backup to complete the flashing process, if power failure during flashing, your device may be bricked/damaged. * If you are getting “Error Code 10: Find port failed” while installing firmware then install BOS Solution by double click on registry file and restart your computer. * While changing firmware, if your device is creating error code: 13, error code: 17, error code: 19, etc. then use this alternate unlocking method Boot Short Method to Unlock Any Latest Huawei Modem/Router of Algo V4. * Check that with non-accepted SIM your device prompts for enter SIMLOCK CODE in web-interface and also you have some remaining attempts left. If device is not prompting for SIMLOCK Code then detect it in dc-unlocker by clicking on Magnifying Glass and mention it in message. 2. step may or may not required in this method. 4. step may or may not required in this method. 6. 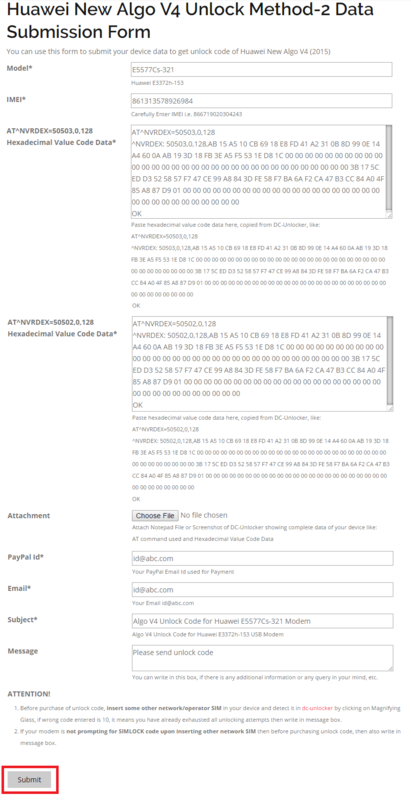 After this, now you will need to fill Data Submission Form to get unlock code/ datalock code. After you fill all fields, press “Submit” button. Upon successful submission you will immediately receive a confirmation email. After few minutes/hours you will receive an email from unlock4modems@gmail.com containing Unlock Code/ NCK (Network Control Key) and OEM/ DATALOCK Code (Optional) for your device. 7. Now Download & install Universal Upgrade Firmware (21.180.–.–.— or above version which is available for your device) and flash it. Its the time, your device is ready to accept unlock code. 8. Enter received Unlock Code / NCK into device (via web-interface), click apply and enjoy. Congratulations! Now it’s free!. It can accept any sim cards from any Mobile Carrier Worldwide. How to back port mode to NDIS mode to enter NCK? I done all thing but after getting IMEI encrypted data modem is still in port mode. Try to disconnect device from PC and connect again. If does´t success – you can simply flash General Upgrade Firmware. Connect your device to PC, so that you can access web-interface via http://192.168.8.1/or otherwise connect trough wifi while remain connected to PC via USB port. Open web-interface via http://192.168.8.1/and run Switch Mode application / script to get your device in COM ports mode and in this process, COM ports will be enabled. Now, detect the device under DC-Unlocker, which you have already downloaded. It will show the Application and Diagnostic ports and your device’s complete detail. (i). Connect the modem or the router to the PC via a USB-cable and wait till complete the software (coming with device) installation. Usually, when you first time connect the device to a PC, you have the CDROM separate section that contains the software installation. (ii). The result of this step is to identify the device in Device Manager under “Modems” and the “Ports (COM & LPT)”. (iii). If you run the software to connect to the Internet, such as Dashboard / Connect Manager, etc., before using Huawei 2015 Code Reader – close it. If you get OK in the screen, then you have successfully unlocked your device forever. Note : Replace UNLOCK CODE with your code corresponding to the IMEI. Important: You can send comments and Suggestions to improvement unlocking complication here, it will be appreciated. Users who likes this post can like our Facebook Page for latest tips and tips.